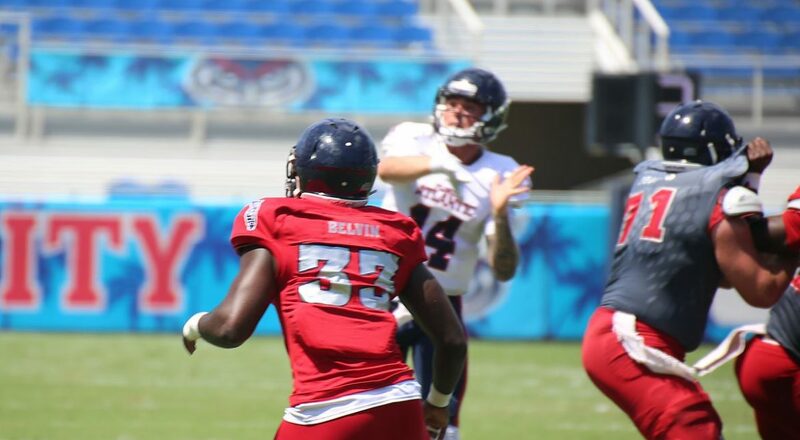 BOCA RATON – A quarterback competition that remained too close to call much of the spring fittingly ended with Justin Agner and Nick Tronti being named spring co-MVPs of FAU’s quarterback unit. With incumbent starting quarterback Chris Robison suspended all of spring Tronti and Agner split time piloting the first team. 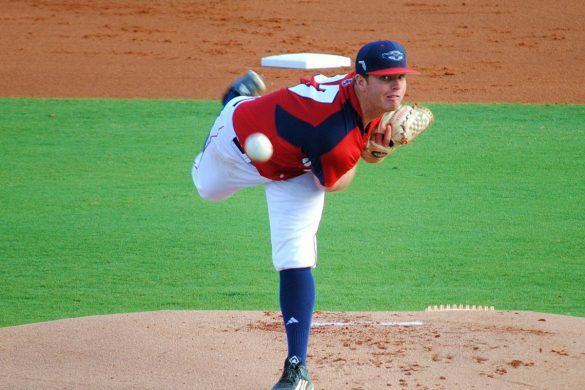 Tronti seemed to have the advantage early in spring, but Agner finished strong. Neither quarterback claimed the spring game MVP award, however. On the offensive side of the ball wide receiver John Mitchell and tight end Harrison Bryant split the award. 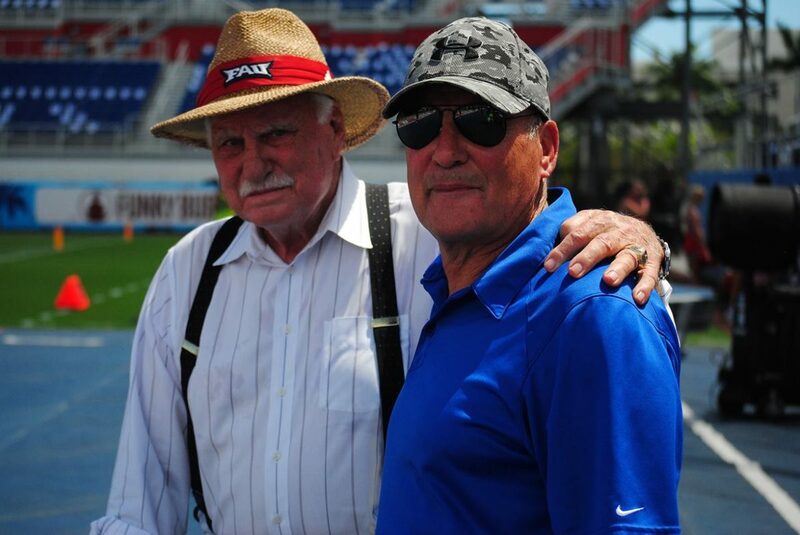 Both players caught two touchdowns for opposing teams in that game. Defensively, safety Armani Adams and linebacker Akileis Leroy shared the award. 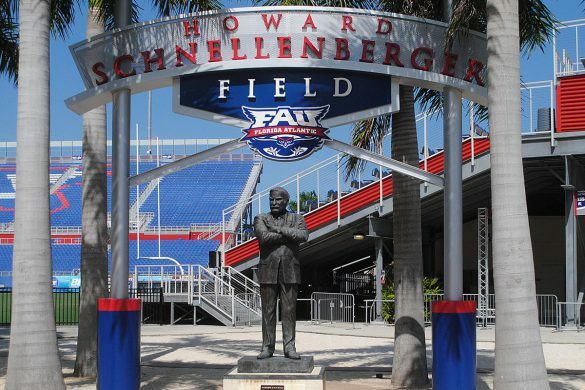 FAU coaches recognized the players for their spring accomplishments during an end-of-spring banquet held at Howard Schnellenberger Field. 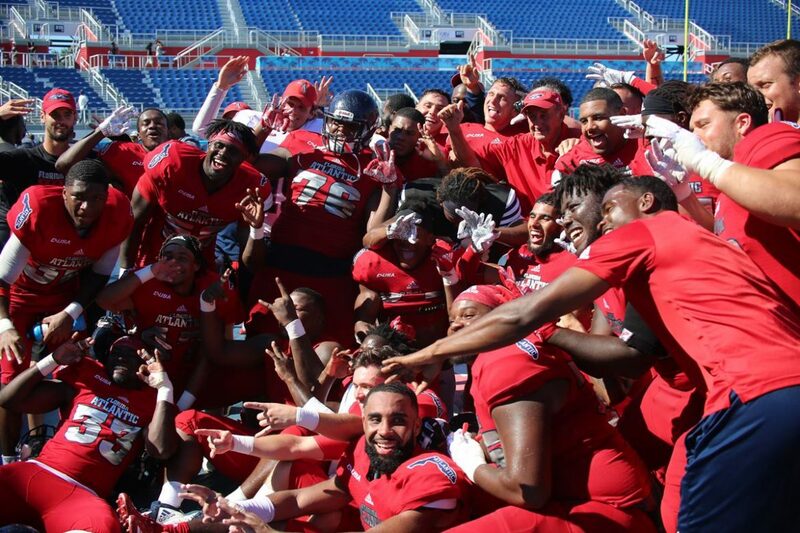 Members of the Red team, which won the spring game, ate steak. Gray team members dined on hot dogs. Walk-on guard Deon Humphrey, who moved to the starting unit after a staph infection sidelined Nick Weber for the final three weeks of spring, was one of five offensive players named most improved. 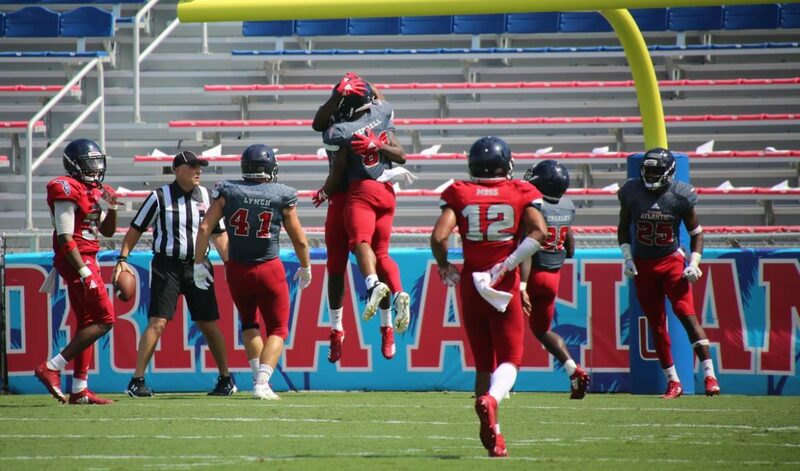 Running back Daniel Leconte, who made big plays when healthy, joined Walton among the most improved, as did wide receiver James Brunson, center Jake Jones and wide receiver Jordan Merrell. 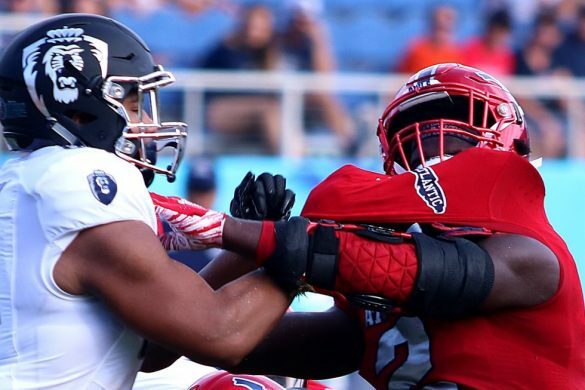 Defensively coaches honored safety Armani Adams, defensive tackle Will Davis, cornerback James Pierre, cornerback Chris Tooley and linebacker Hosea Barnwell as their most improved players. “I want that to be my standard going into the season,” Walton said. 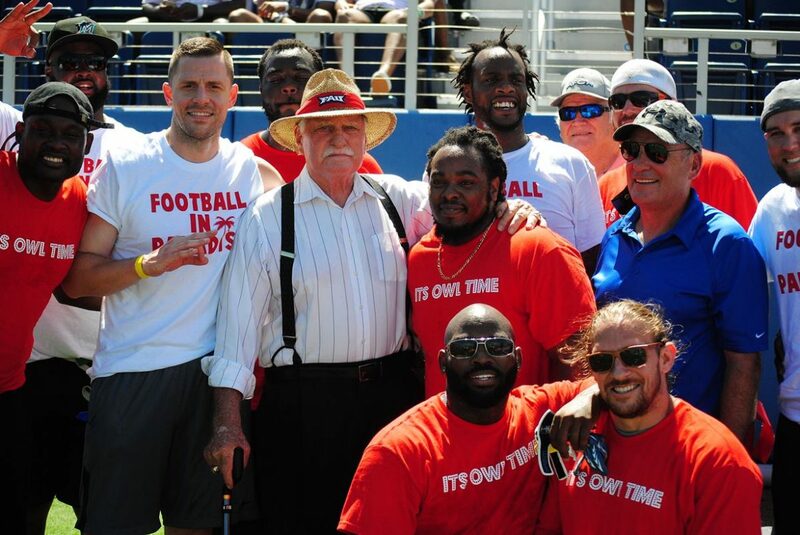 John Raine claimed tight end MVP while Merrell snagged the wide receiver MVP award. James Charles began the spring as the starting running back and ended the spring there, ahead of former Alabama running back BJ Emmons, slithering and racing to his position’s MVP award. Ray Ellis and Leighton McCarthy shared the defensive linemen MVP. Rashad Smith claimed the linebacker award, while safety Da’Von Brown earned the defensive backs MVP. Special teams coordinator Jaron Fairman chose Jordan Helm as his MVP. 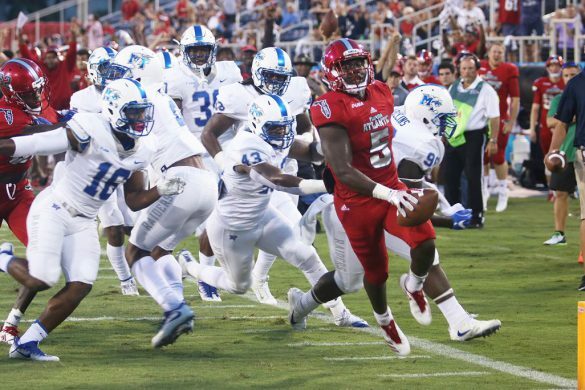 Leconte, Jones and wide receiver Brandon Robinson earned top walk-on honors on the offensive side of the ball, with defensive tackle Collin Dell, linebacker Cecil Rolle and cornerback Malik Vigille earning the honors on defense. 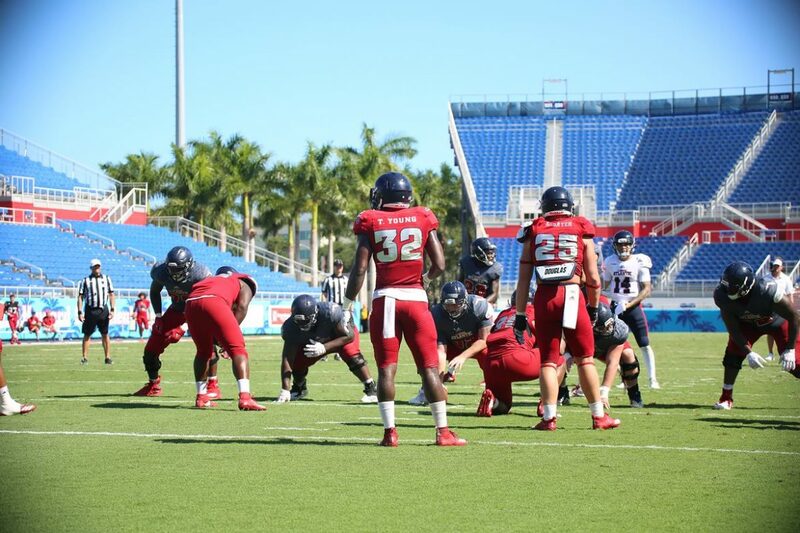 BOCA RATON – FAU’s defense bested , and at times battered, the Owls’ offense for the third time in four tries, physically dominating for long periods of Saturday’s scrimmage, which concluded Florida Atlantic’s spring practices. The offense actually started quickly but struggled to maintain that early momentum. 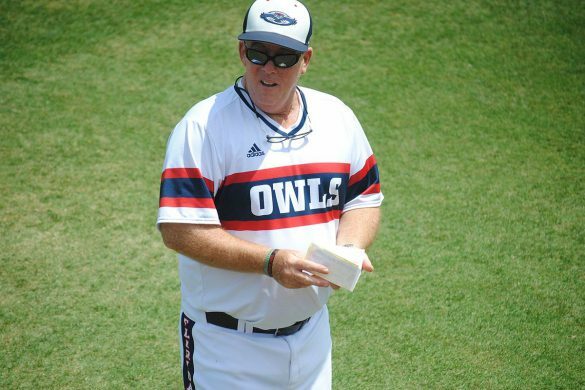 For the most part the scrimmage reinforced much of what already believed with regard to the Owls this spring. The units that struggled much of the spring didn’t fare too well on Saturday. Those that enjoyed a good spring generally capped the spring with successful outings. What stood out to us on Saturday? Here’s our final Saturday six pack of the spring. 1. Lack of WR depth is glaring. 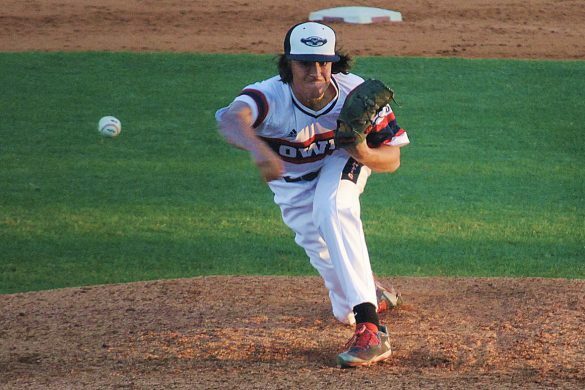 A groin injury kept Pico Harrison from playing any of the spring scrimmages. John Mitchell didn’t play on Saturday because of a minor undisclosed injury. 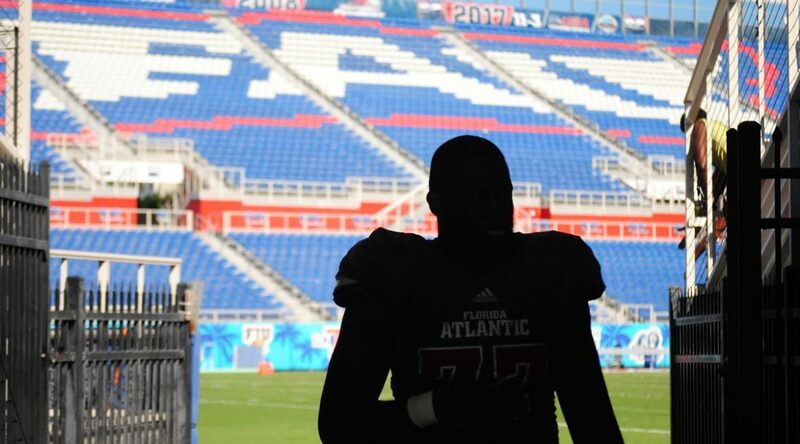 Jefftey Joseph, who enjoyed a good first scrimmage, didn’t play either. 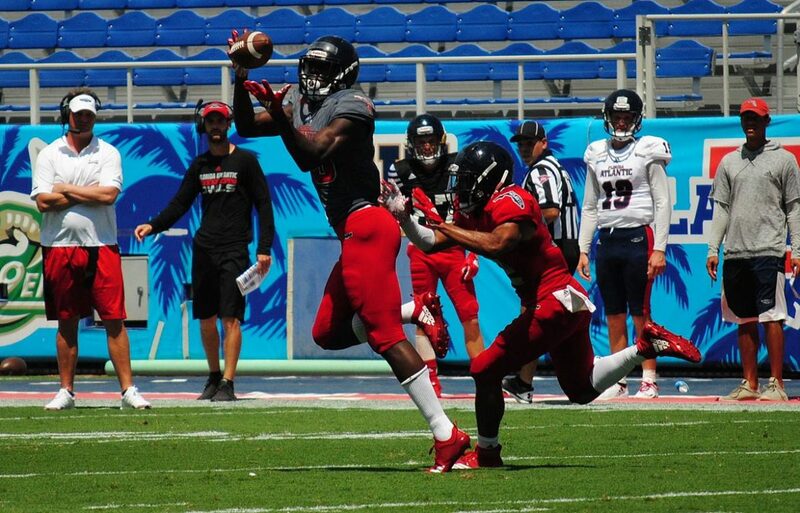 The remainder of FAU’s wide receivers struggled to get open, almost completely removing deep or even intermediate completions to wide outs on Saturday. 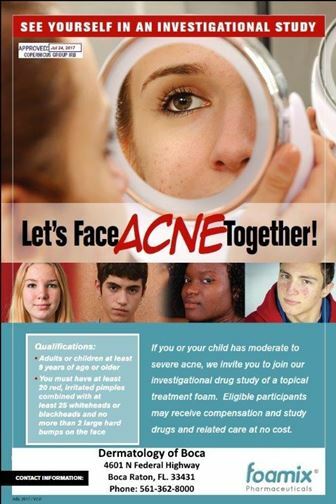 It’s a major concern heading into the fall. 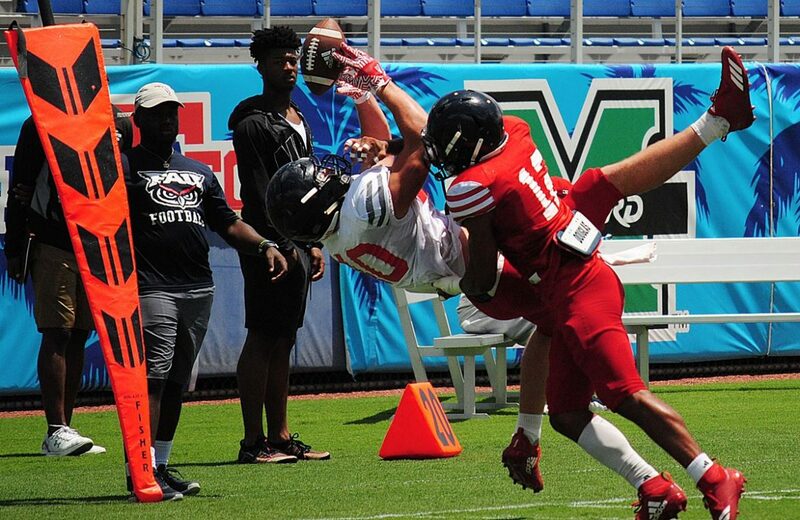 Of note, unheralded walk-on D’Angelo Eiland delivered some exciting plays this spring and could make a bid to contribute in the fall. 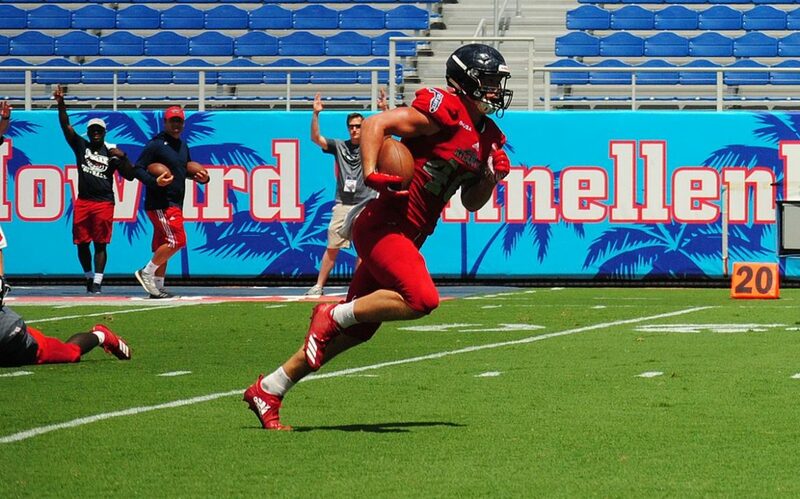 He set up his own short touchdown catch from Trent Wessel by catching an out route, faking Andrew Carrie out of his shoes, and racing more than 60 yards. 2. Young DBs continue to impress. With starting strong safety Zyon Gilbert sitting this one out and free safety Da’Von Brown limited, Armani Adams and Teja Young received their first extended action of the spring. Adams picked off two passes and delivered a big hit. Young, who may have been battling the flu, played well. And one play after registering a sack Ahman Ross delivered a viscous hit to running back Daniel Leconte, which left both players stunned. 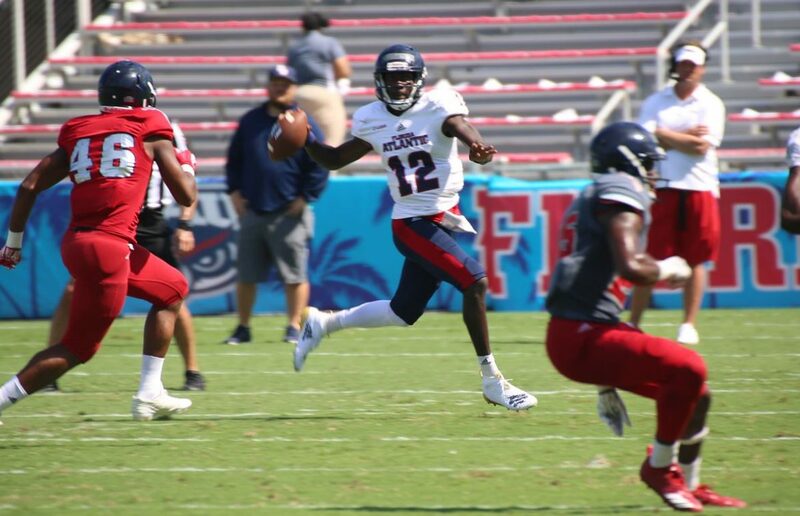 Dwight Toombs made some plays in the secondary and in the offensive backfield, completing a solid first showing for the true freshman. 3. The quarterback position remains unsettled. 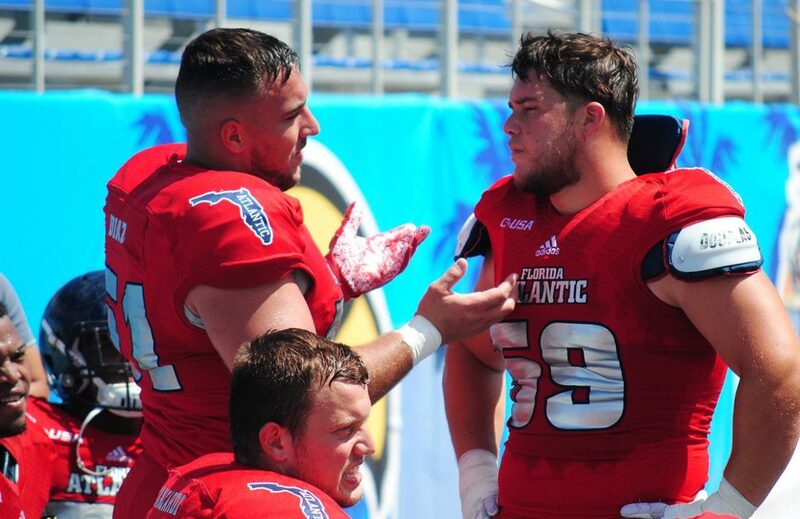 Nick Tronti began the scrimmage by leading one of the few long, sustained drives of the spring, but he also fumbled without being touched and threw an interception. 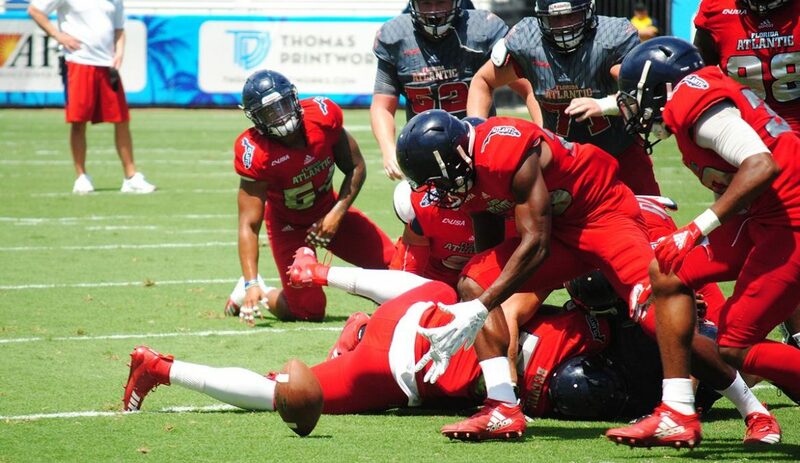 Agner’s unforced fumble resulted in a Marcel Southall return for a touchdown. 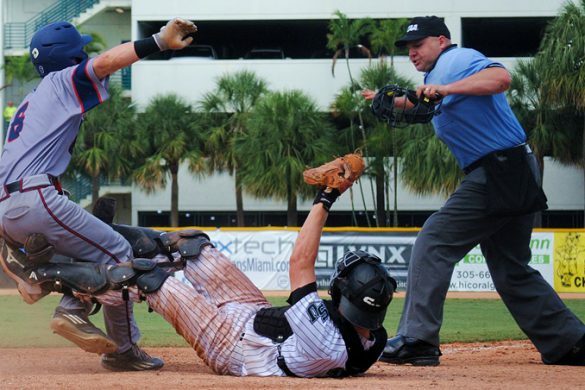 Suspended incumbent starter Chris Robison is expected back in the fall. 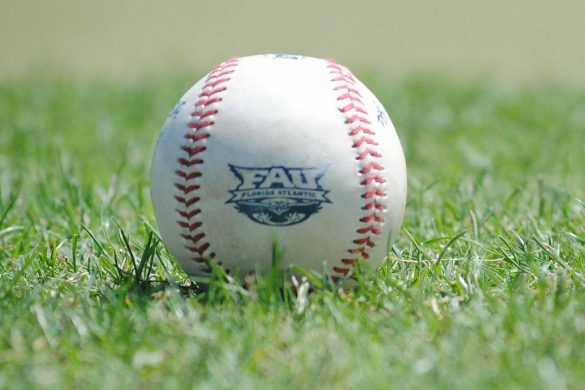 FAU appears headed for a three-way battle. 4. The running back unit performed better but still has a ways to go. 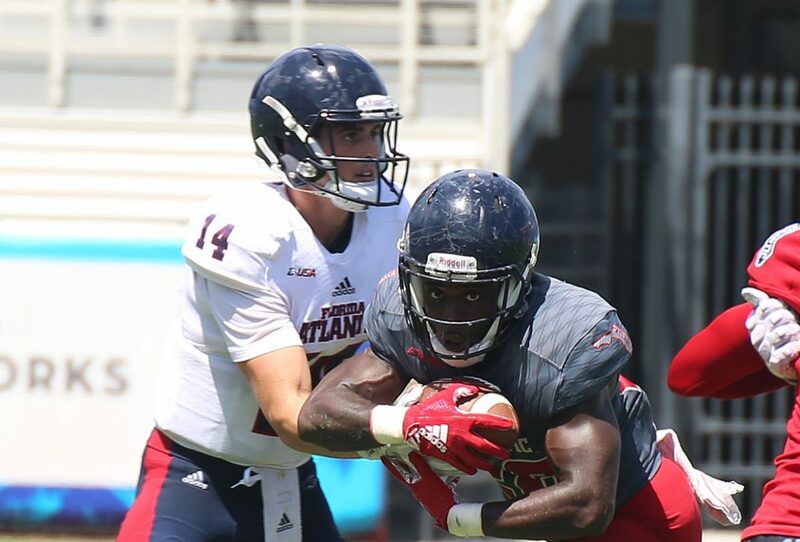 On the first possession of the scrimmage BJ Emmons delivered the Owls’ first rushing touchdown since the first scrimmage. He appeared to have a little more juice than in recent weeks. James Charles still looks slippery, and he added a rushing touchdown. But the first carry of the day went to Leconte. Listed at 5-foot-10 and 190 pounds, Leconte plays bigger than his size while flashing surprising speed. He returned from that big hit Ross delivered to race 70 yards for a score. 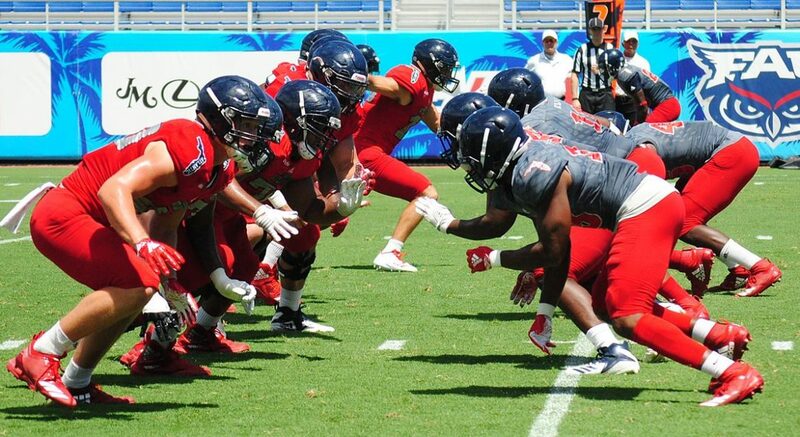 Coach Lane Kiffin says he’s not certain why the Owls nicknamed Leconte “Muscle Beach,” but he did compare Leconte’s spring to the spring Silver Saunders had last year. 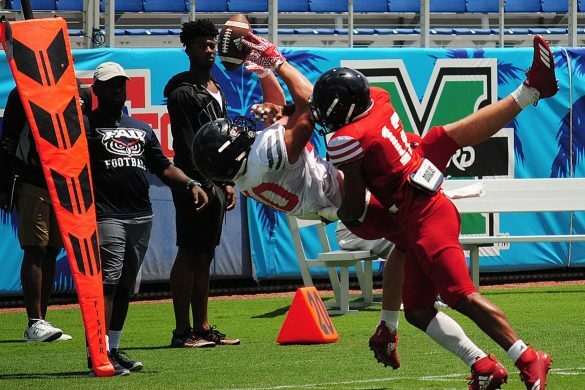 Leconte still has a ways to go to claim playing time come fall, but he entertained this spring. 5. 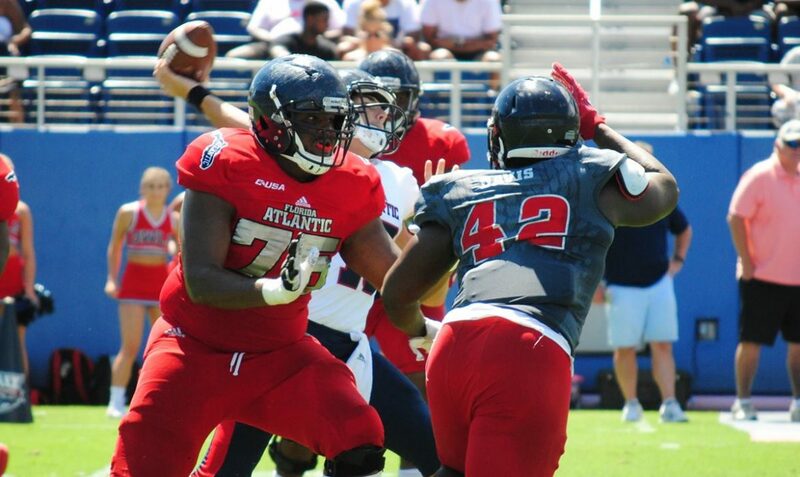 FAU’s interior defensive line enjoyed another good day. Charles Cameron wasn’t spectacular on Saturday, but he was solid. Noah Jefferson returned after missing the previous two scrimmages but looked rusty. 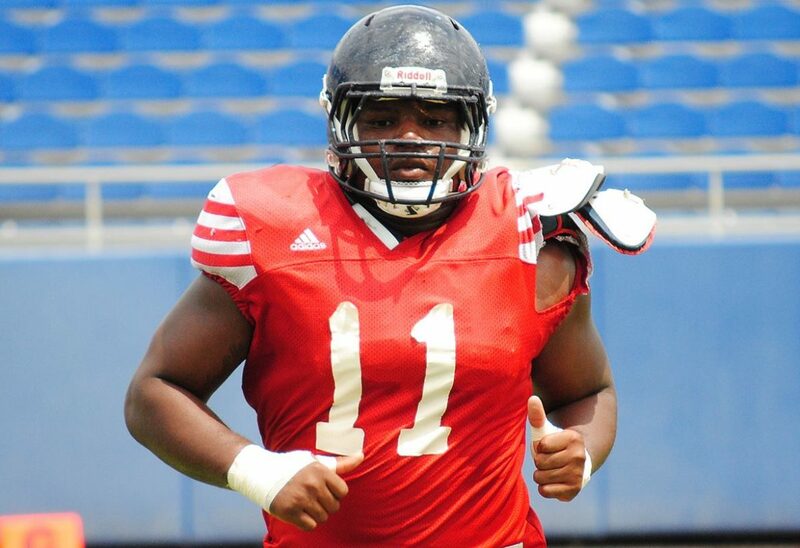 Will Davis enjoyed his best scrimmage of the spring, scooping up a fumble. But the rising star on Saturday was Jaylen Joyner, who spent much of Saturday in the backfield. 6. 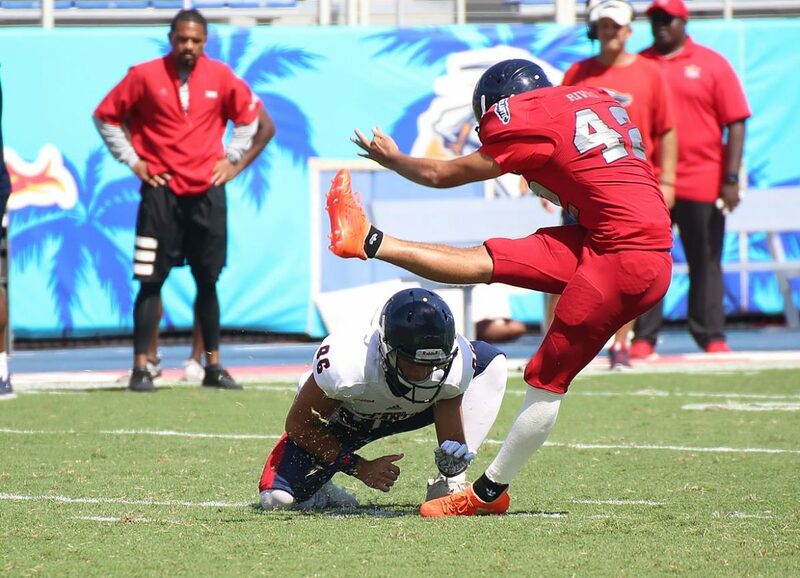 BJ Emmons is returning kickoffs. If the season started today it appears as though the former Alabama running back would get the first shot at kickoff returns. 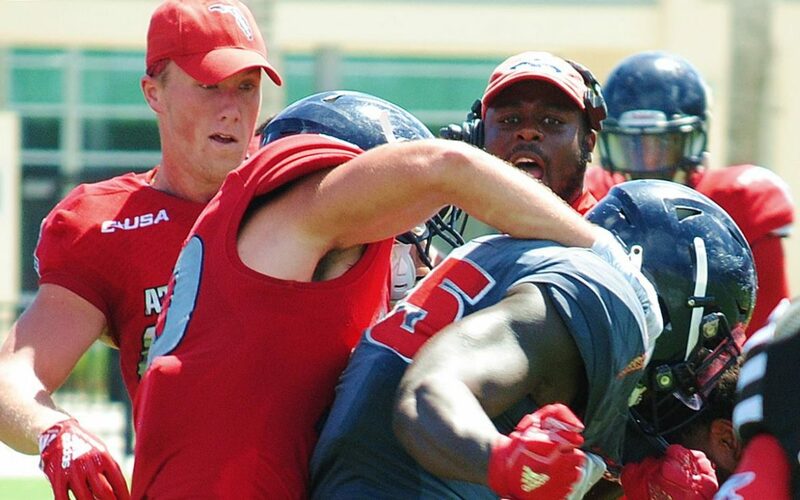 Kiffin did the same with big running back Tyrek Tisdale when that duo first arrived in Boca Raton. It didn’t work out so well. 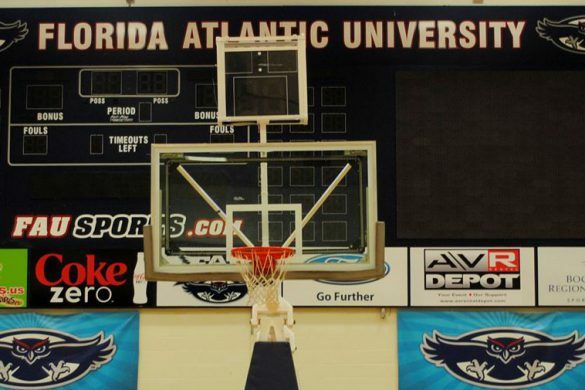 Tisdale injured his knee early in his freshman season and hasn’t been the same since. James Brunson is currently the No. 2 kickoff returner, but some of the talented incoming freshman will likely get to prove their worth as returners once they arrive on campus. 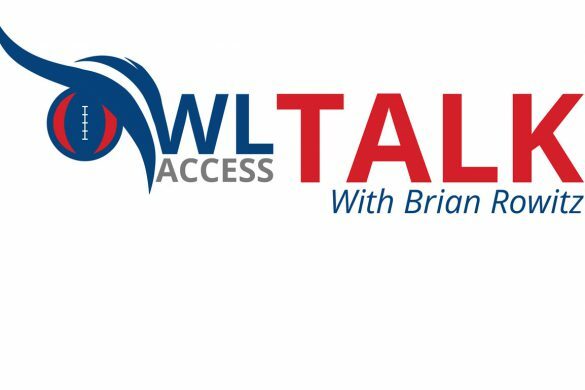 Extra Point: The Owls entered spring with plenty of questions on offense and they didn’t appear to solve many of them. 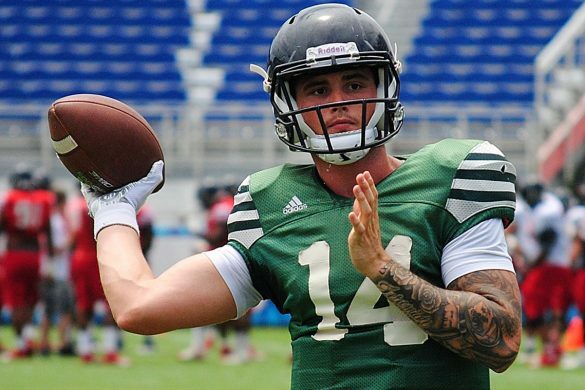 Regardless of whether Robison is back, the QB situation will be unsettled at the start of fall camp. 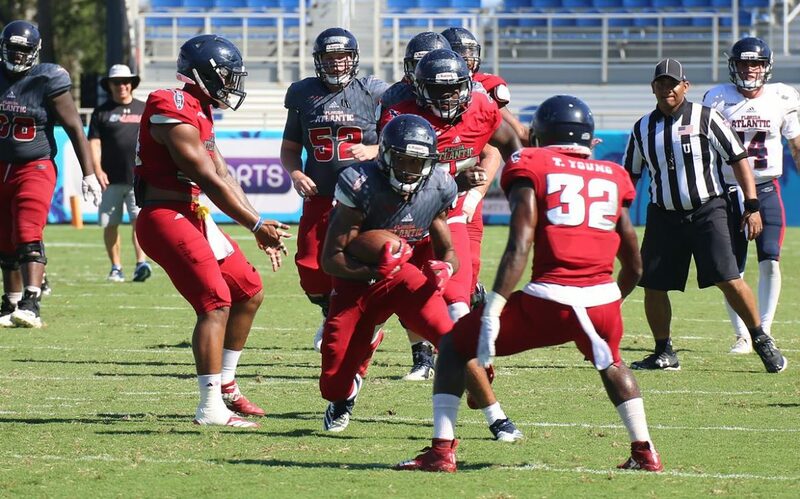 Emmons didn’t take control of the starting running back spot, though he did improve. The wide receiver unit is a flat-out mess. 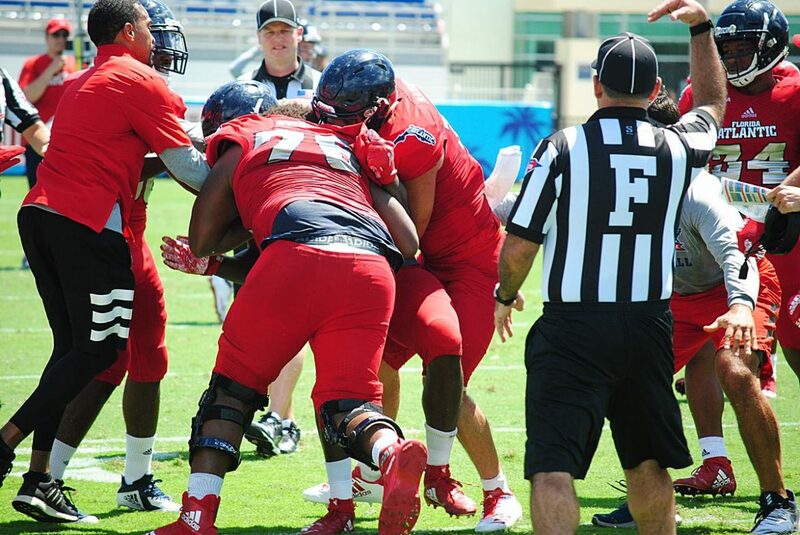 And the offensive line struggled to block FAU’s new defensive scheme throughout the spring. Tight ends Harrison Bryant and John Raine were the only two offensive players deserving a high grade this spring. 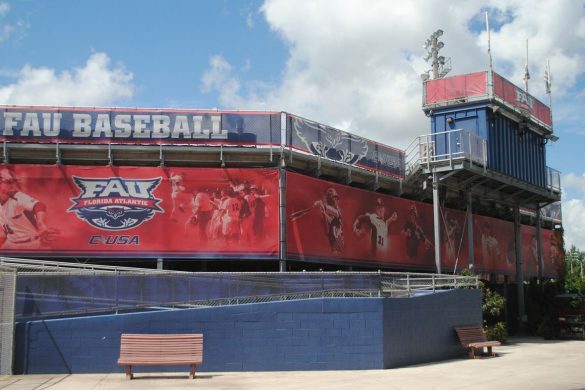 BOCA RATON – FAU will conduct spring practice No. 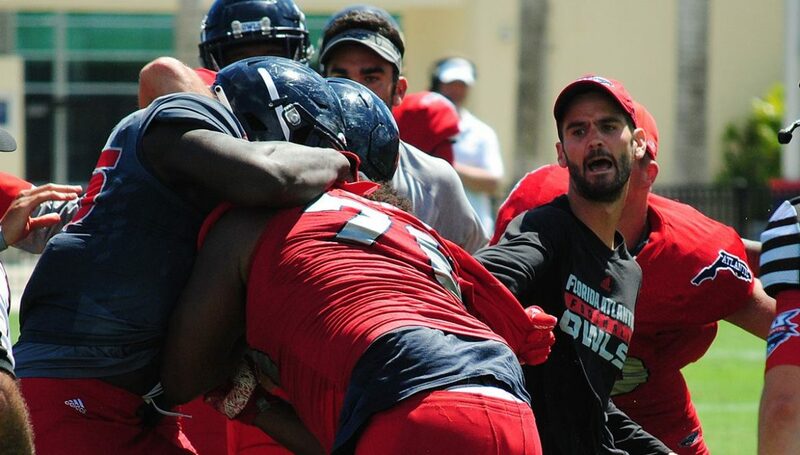 15 on Saturday, a scrimmage that will mark the Owls’ final outing until fall camp. 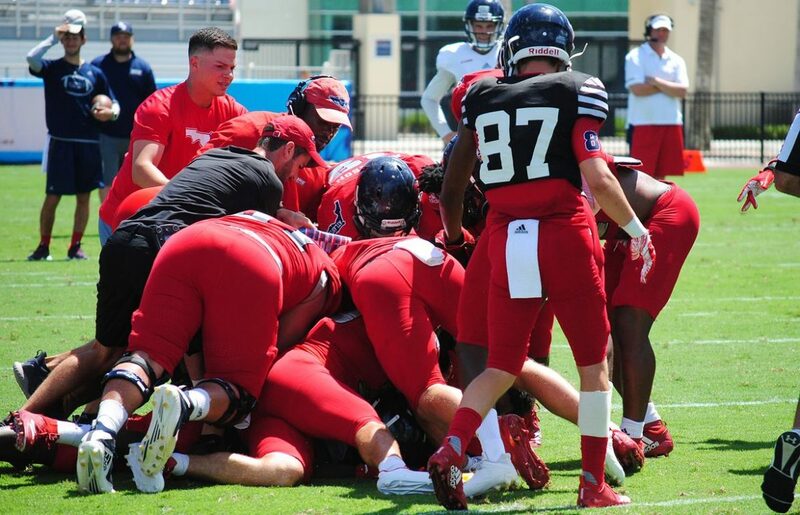 It will be the Owls’ fourth scrimmage in five weeks and, despite a roster size limited by injuries, academic suspensions and transfers, will feature live tackling – at least for the first half. 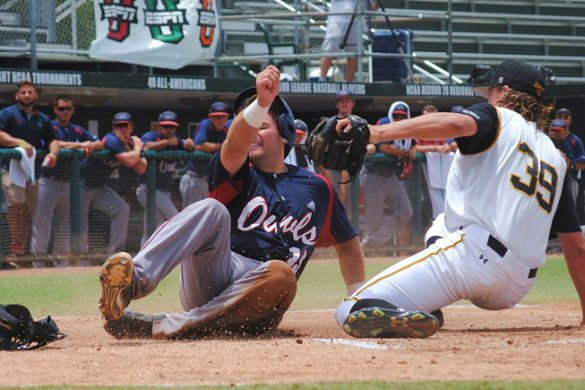 Three scrimmages provided a pretty good idea as to what to expect from the Owls. The defense struggled early, the offense struggled late. 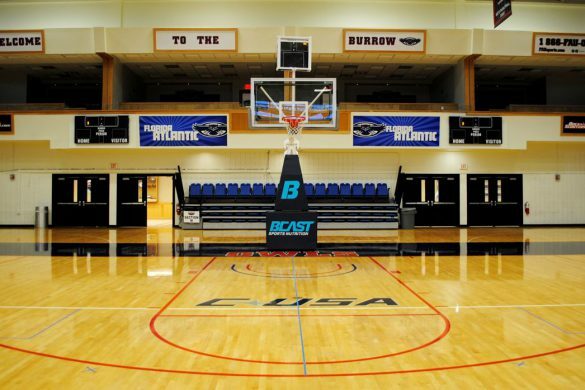 Saturday’s scrimmage is closed to the public – that hasn’t changed – but the media can attend. 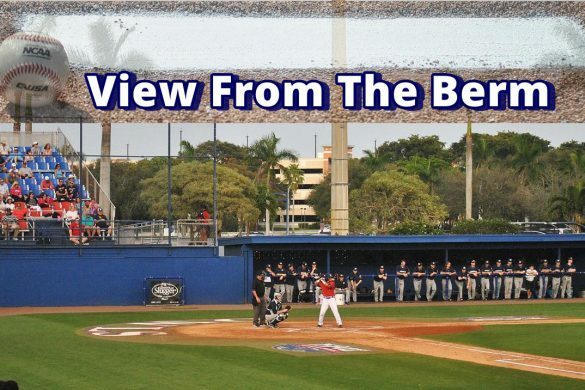 What will we be watching for in the final scrimmage? Plenty. 2. Those DTs. 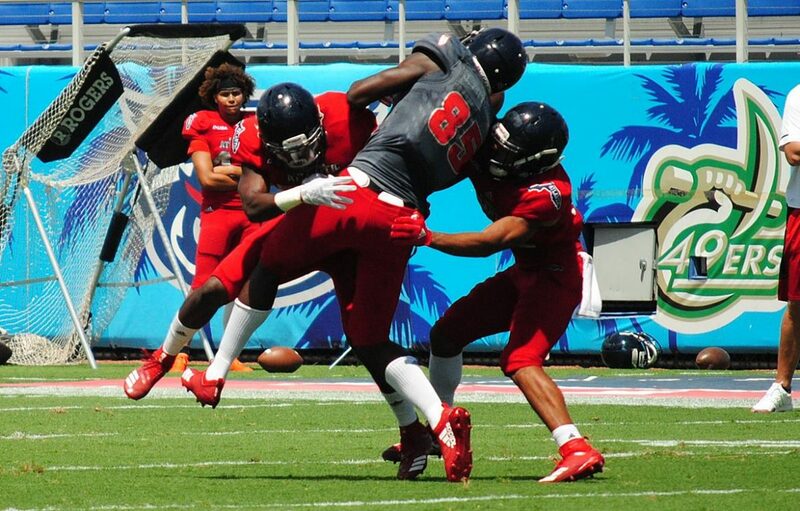 Charles Cameron and Noah Jefferson make for a formidable force in the middle of the defensive line. Cameron’s been a beast all spring. 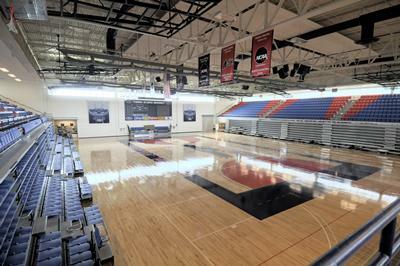 Jefferson, however, hasn’t played in the two previous scrimmages after being benched for academic reasons. He returned to the practice field this week. It’s unclear how much Jefferson will play and with which unit, but if he’s on the field with Cameron, it will be a must watch. 3. Catching on. John Mitchell has made big plays this spring but has yet to show the consistency the Owls need. 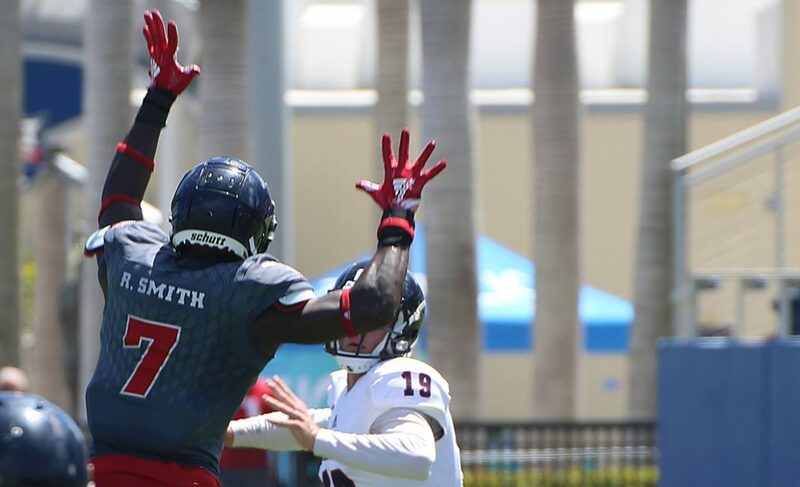 Willie Wright hasn’t been all that impressive this spring. Pico Harrison’s groin injury should once again keep him out of the scrimmage, but there’s no reason to believe it won’t be fine come the fall. Tight ends Harrison Bryant and John Raine have been the biggest pass catching threats this spring. 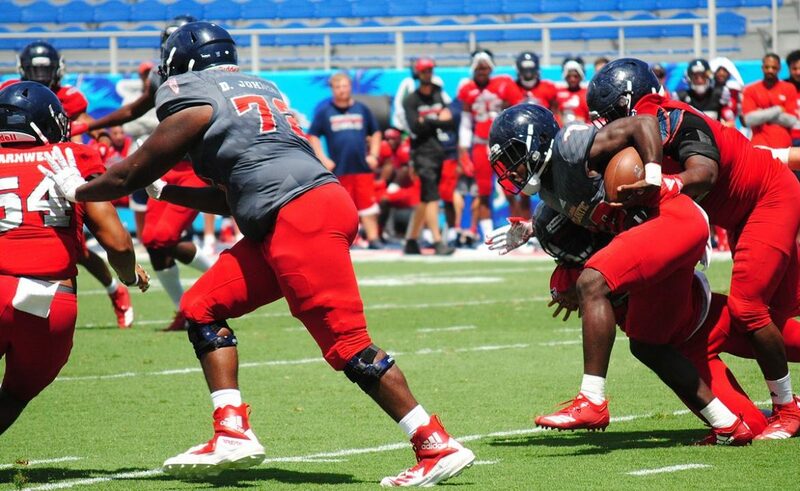 Can James Brunson or Ladante Harris give Kiffin a reason not to immediately place incoming freshmen ahead of them on the depth chart come the start of fall camp? 4. Defensive Young Guns. 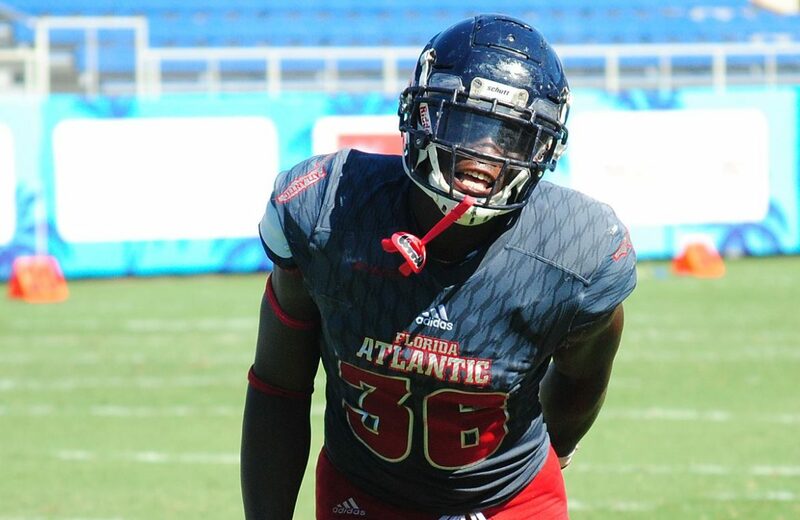 We wrote earlier this week about sophomore safety Teja Young’s strong spring. Redshirt freshman safety Armani Adams has the look of a future star, and took some snaps with the first team this week. 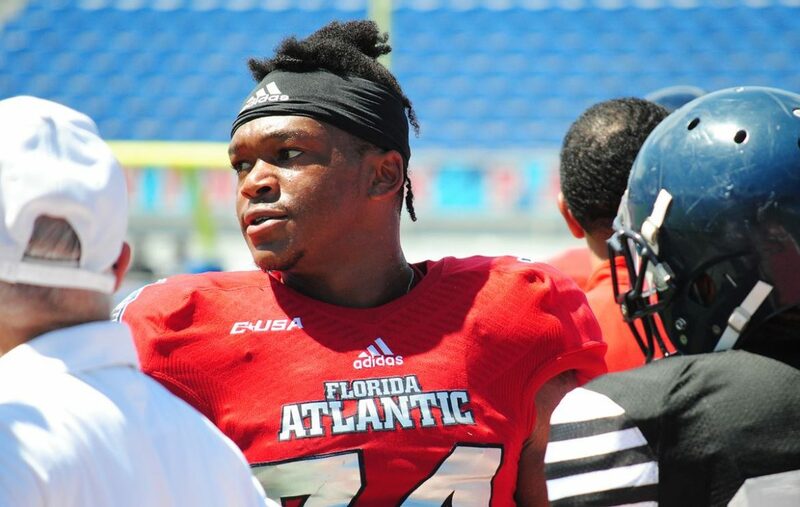 Redshirt sophomore Ahman Ross looks like he can thrive in a variety of roles, and true freshman Dwight Toombs made his share of plays. 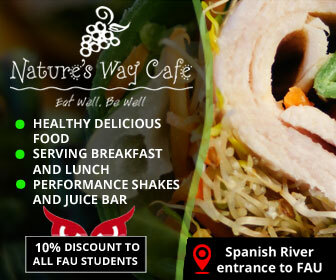 Will the Young guns close spring with a strong effort. 5. Oh yeah, the quarterbacks. 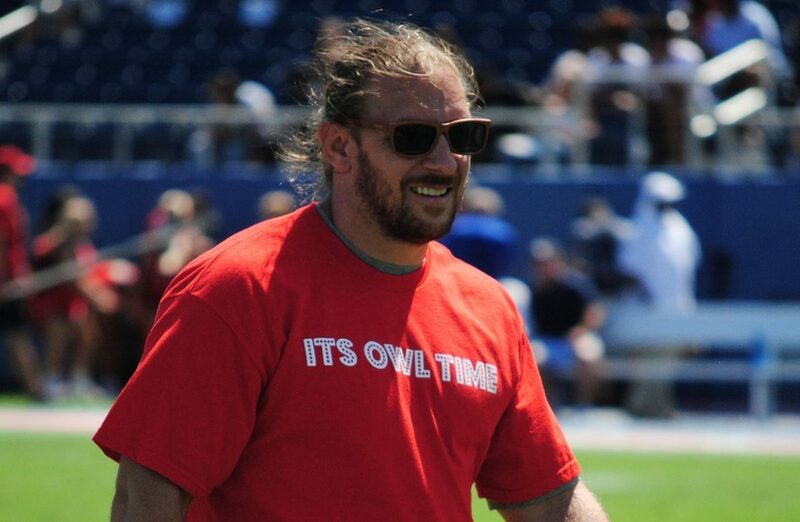 Lane Kiffin suspended incumbent starting quarterback Chris Robison for the entirety of spring practices, and even though the redshirt sophomore has been more visible around the Oxley Center these last two weeks there’s no indication Kiffin will lift that suspension for Saturday. 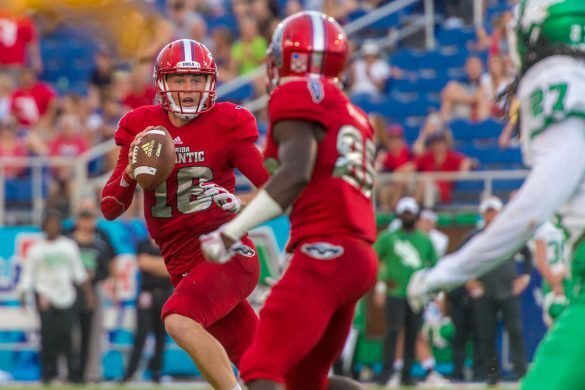 It’s hard to believe that Kiffin will simply hand the job back to Robison come the fall, so this is a chance for either Nick Tronti or Justin Agner to position themselves to be in direct competition with Robison. Tronti has the edge at the moment, but not by much. 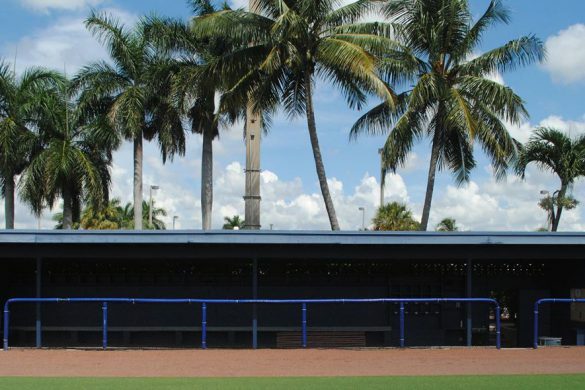 BOCA RATON – There’s upperclassmen, and then there’s Ray Ellis. 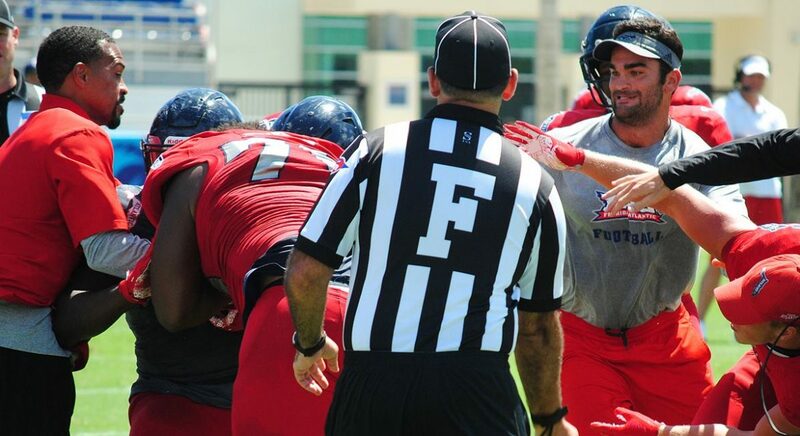 The soon-to-be 23-year-old sixth-year senior defensive tackle is participating in his first FAU spring practice since 2016 – and he’s loving it. “I’ve been an upperclassman now, this is about my third or fourth year now,” Ellis said with a laugh. 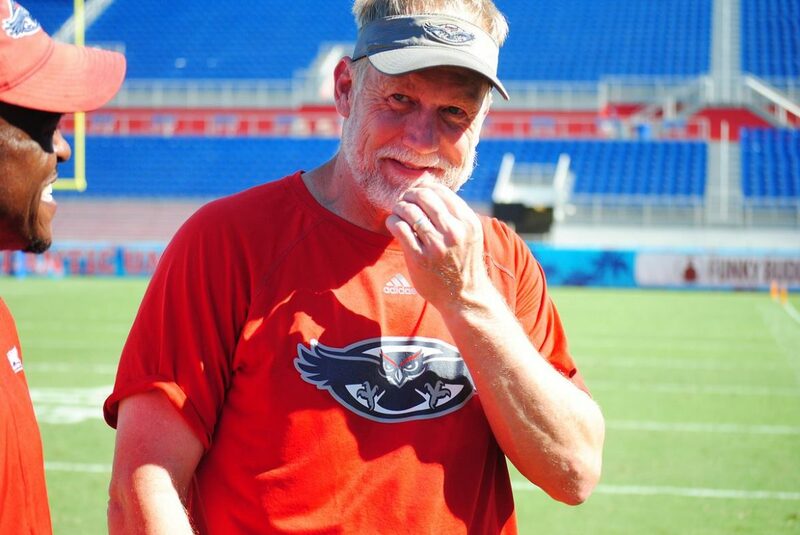 To put that in perspective, Ellis has been an upperclassmen longer than most at FAU have been classmen. 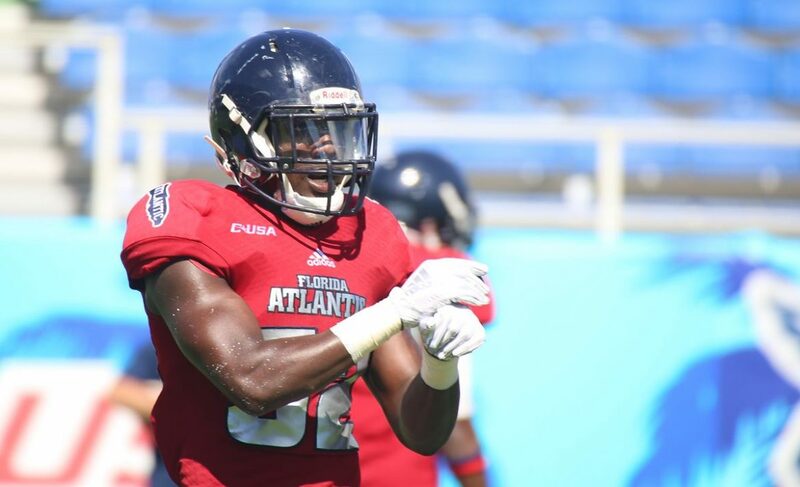 Playing alongside the likes of Trevon Coley, Trey Hendrickson and Brandin Bryant, all of whom are currently playing professionally, Ellis started two games as a true freshman in 2014 and five more as a sophomore, recording 38 tackles over his first two seasons. When Coley, now a starter with the Cleveland Browns, graduated, Ellis quickly switched uniform numbers to the 11 previously worn by Coley. A torn ACL in his right knee incurred during fall camp forced Ellis to miss all of the 2016 season. He returned for 2017, working his way into first year coach Lane Kiffin’s defensive tackle rotation. But at the moment everything appeared to be working in his favor, that same right knee dealt Ellis another blow. 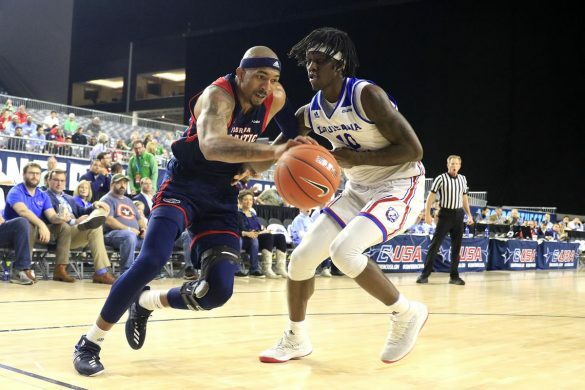 During the first half of 2018’s season-opener against Navy Ellis knee gave way again, ending his season before halftime. “I could walk, but I knew something wasn’t right,” Ellis said. Ellis persevered. He returned for 2018, playing in all 12 games for the first time in his career. 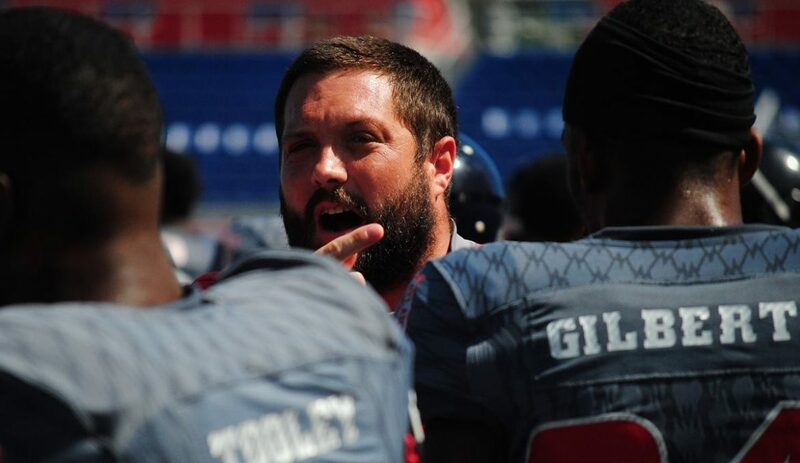 Though he only recorded 19 tackles on the season, Ellis gained more playing time as the season increased and his leg grew stronger, with his highlight being a six-tackle outing at Marshall. This spring Ellis is playing like he’s missed no time at all. With Noah Jefferson sidelined for academic reasons, the 6-foot-1, 185-pound Ellis is receiving repetitions with the first string. 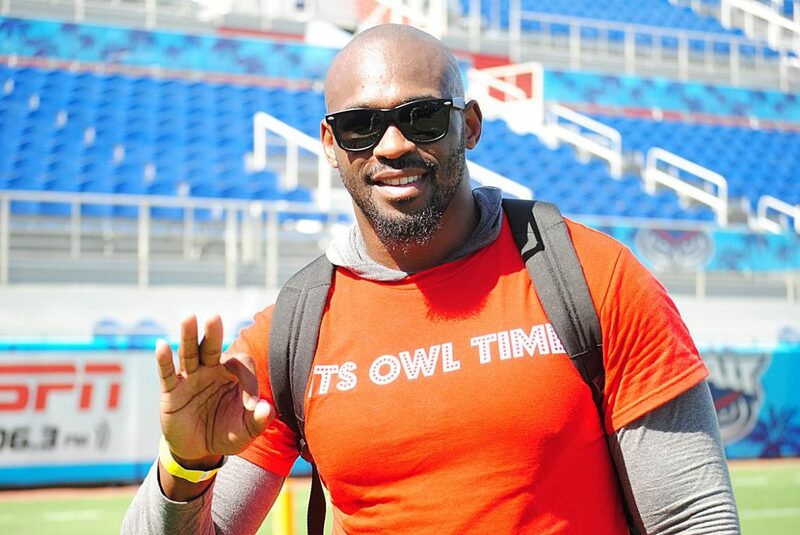 The Owls are still working with the NCAA to secure a sixth year of eligibility for Ellis, but they are confident he’ll be on the field in 2019. 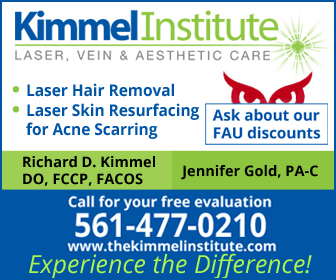 “There’s a huge carryover from the end of the season to the beginning of spring, and from the beginning of spring until now,” Ellis said. 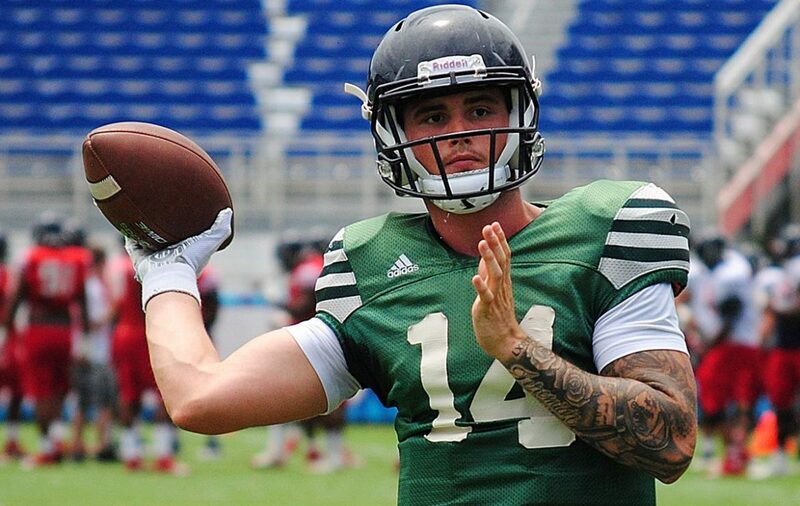 The fact that’s he’s even participating in spring practice should give him a head start. “I get extra time to actually play instead of just going straight into fall camp and having to catch up with what everyone’s already learned,” Ellis said. 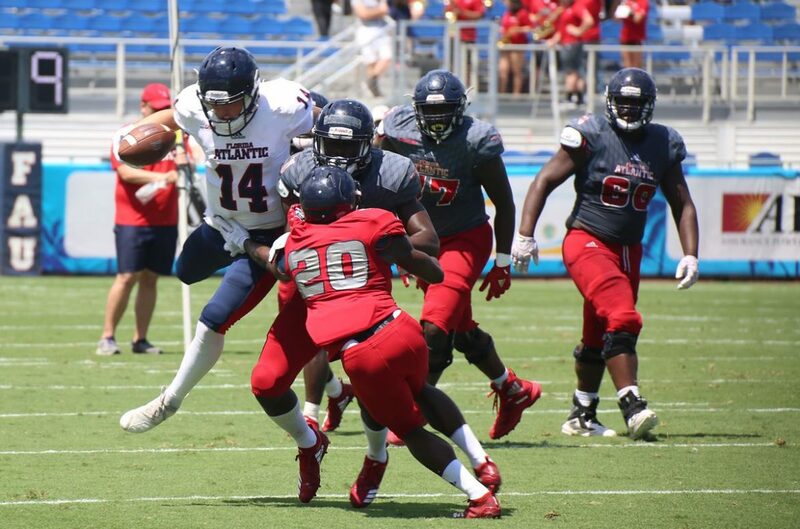 BOCA RATON – Bigger is better for FAU’s offense. Tight ends Harrison Bryant and John Raine are frequently lining up outside and in the slot, towering over the defensive backs opposite them. And that size advantage is proving invaluable. 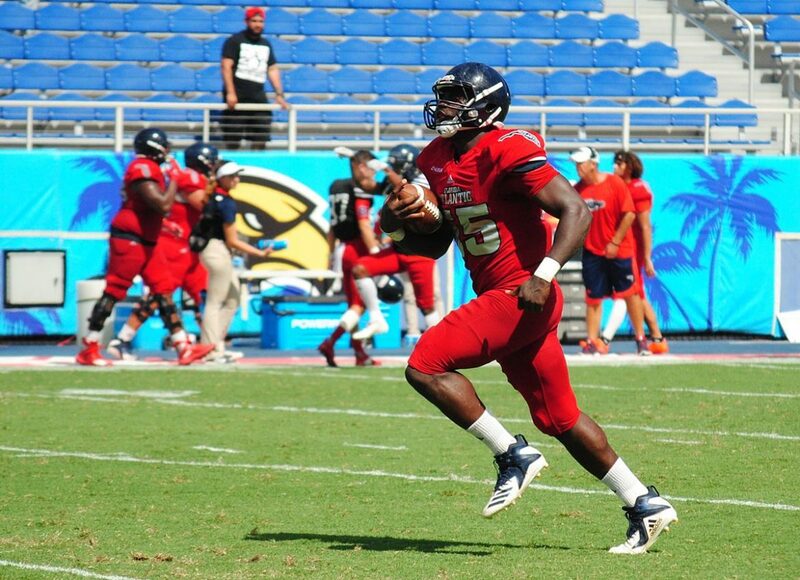 Tronti’s words materialized in FAU’s spring game. 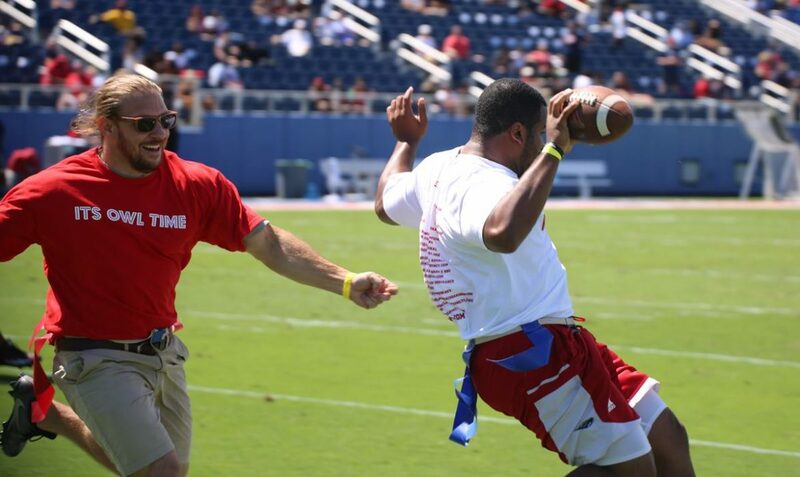 Bryant and Raine caught a combined 10 passes, including both of the red team’s two touchdowns. 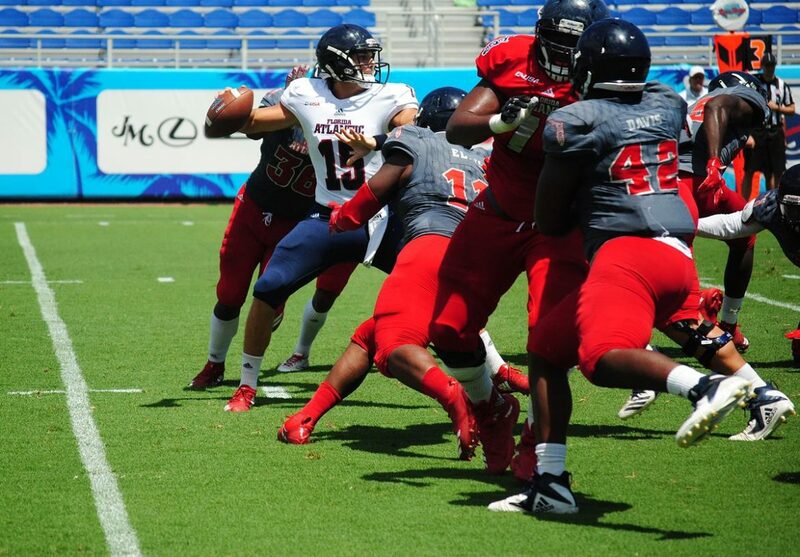 FAU coach Lane Kiffin said splitting out his athletic tight ends creates a “mismatch issue” in the pass game. But their impact as blockers in those packages is equally important. 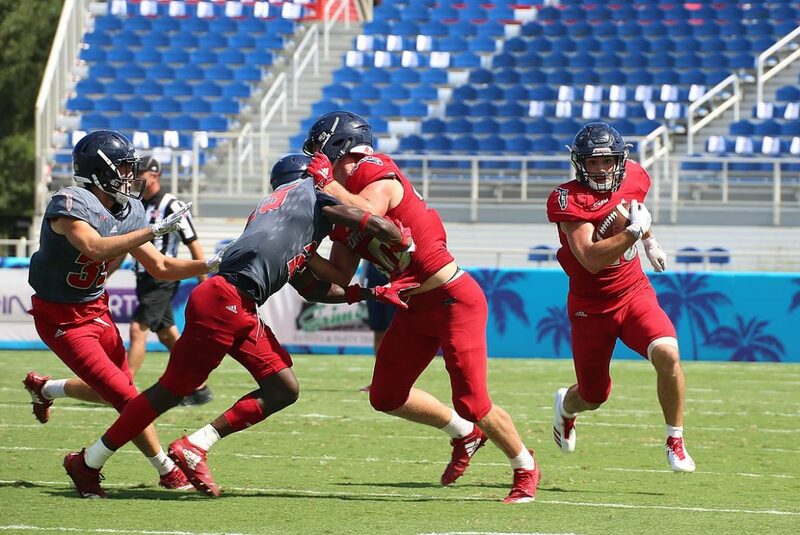 That’s because FAU likes to stretch the field horizontally – using jet motion and receiver screens, for example – to open up downfield shots. For those perimeter plays to work, however, the play-side receivers must hold their blocks. 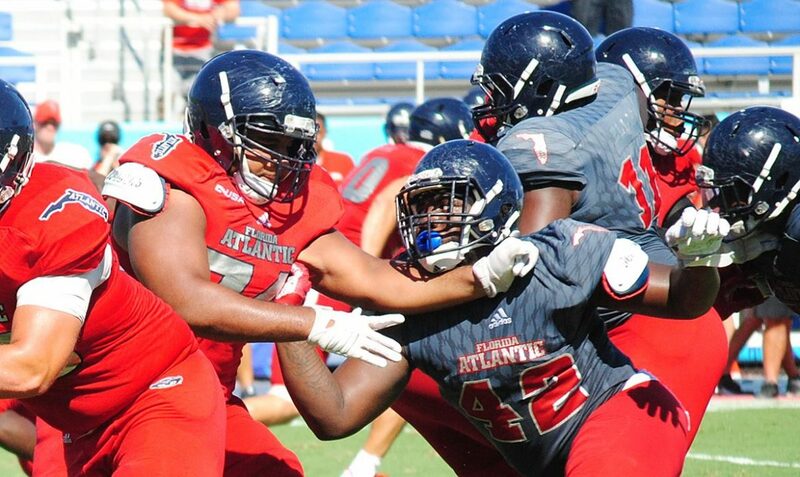 FAU struggled with that at times last season, as top targets Willie Wright (5-foot-8, 155 pounds) and Jovon Durante (6-foot, 165 pounds) were relatively undersized. Raine (6-foot-2, 230 pounds) and Bryant (6-foot-5, 240 pounds) are far from it. 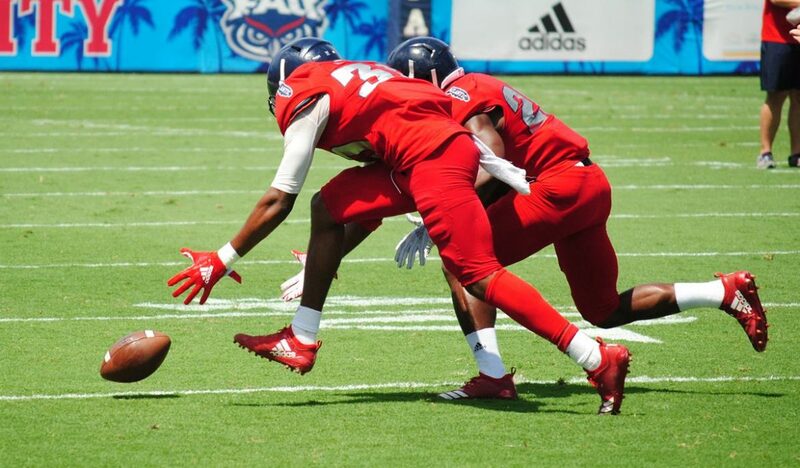 One of FAU’s most utilized plays is the “touch” pass coming off jet motion. The slot receiver – usually Wright – runs inside pre-snap, flying in front of the quarterback to receive a quick forward toss. To gain chunk yardage in those situations, the play-side receiver has to seal his defender inside and give the ball carrier a clean angle to the sideline. The play will be stuffed every time that critical block isn’t executed properly. 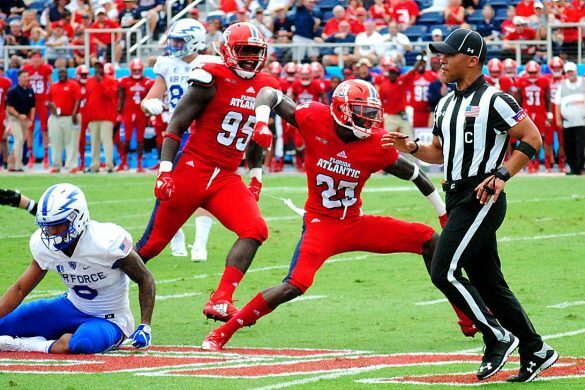 But luckily for FAU – and unluckily for opposing defensive backs – Bryant and Raine have the size and physicality to dominate at the point of attack, especially when the perimeter players they’re blocking now are tiny juxtaposed with the front seven defenders they’re accustomed to facing. 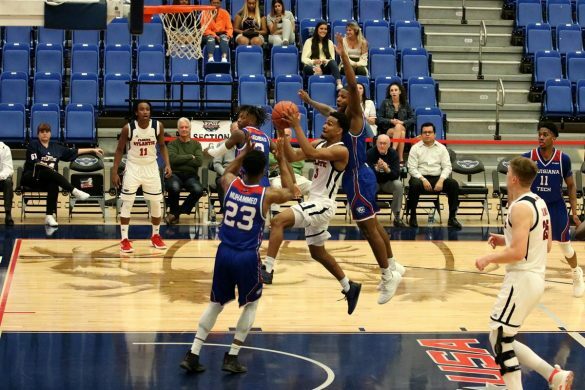 “We should be able to dominate on the perimeter, that’s the main reason why we’re out there so much: to block for those guys and all the athletes we have,” Raine said. Bryant and Raine are no strangers to playing out wide. They both did it in high school, so their increased usage flexed out was more getting back to their roots than starting something new. But Bryant let his position coach, Clint Trickett, know he wouldn’t mind putting his hand back in the dirt every now and then. 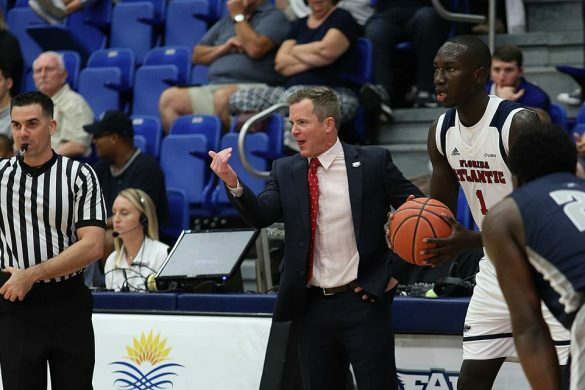 BOCA RATON – Playing one season at Alabama with Lane Kiffin as his offensive coordinator didn’t give running back BJ Emmons a head start learning the offense Kiffin now runs as head coach at FAU. 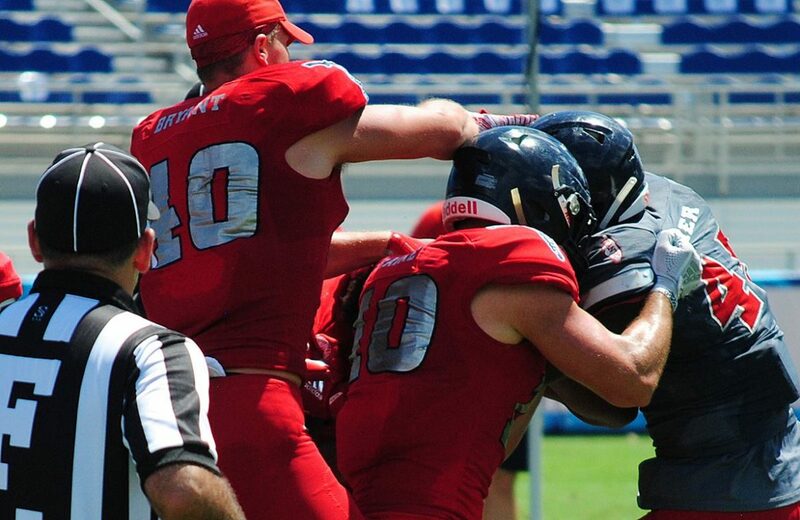 More than learning a new offense, it’s almost as though Emmons is mastering a new position. Emmons carried the ball 35 times for 173 yards and a score in 2016 as a true freshman with the Crimson Tide, where Kiffin employed more of a traditional pro set. 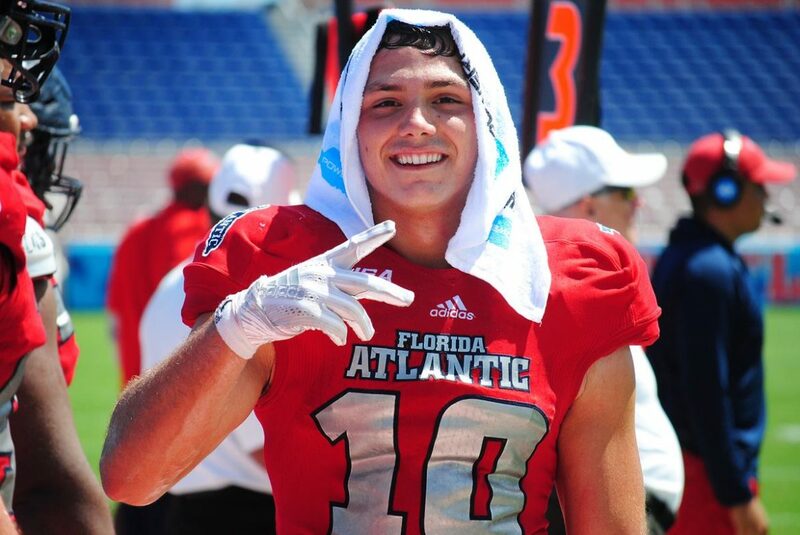 For his sophomore season Emmons transferred to Hutchinson C. C., then sat out last season to get his academics in order before reuniting with Kiffin this spring. Upon his arrival Emmons quickly saw an unfamiliar offense. 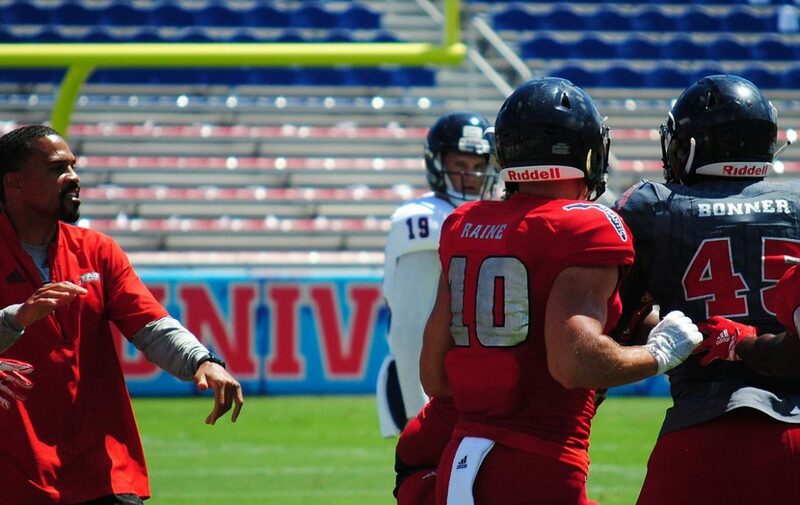 FAU hired Kiffin following the 2016 season, and Kiffin immediately hired Kendal Briles to coordinate the Owls’ offense. Briles installed the uptempo, spread offense he guided to massive point totals at Baylor, teaching that offense to Kiffin in the process. 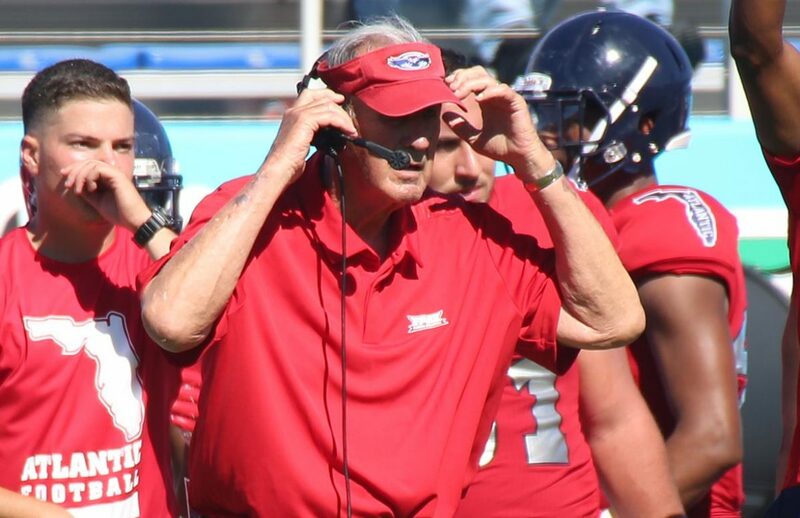 Kiffin kept that offense, loaded with read-options and run-pass options, when Briles departed for Houston after one season, teaching a version of it to current offensive coordinator Charlie Weis. As a result, instead of scanning the defense presnap for potential holes or blocking assignments, Emmons now has many other responsibilities – including relaying the protection calls to the offensive line – he needs to learn on top of mastering a whole new playbook. 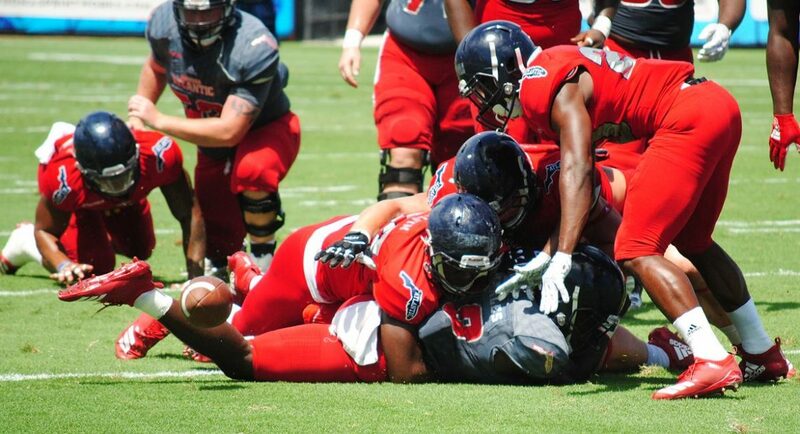 Once the ball is snapped Emmons and the Owls running backs take on a whole new set of tasks, including keeping a low pad level, identifying key landmarks within the play, and locating the middle linebacker. 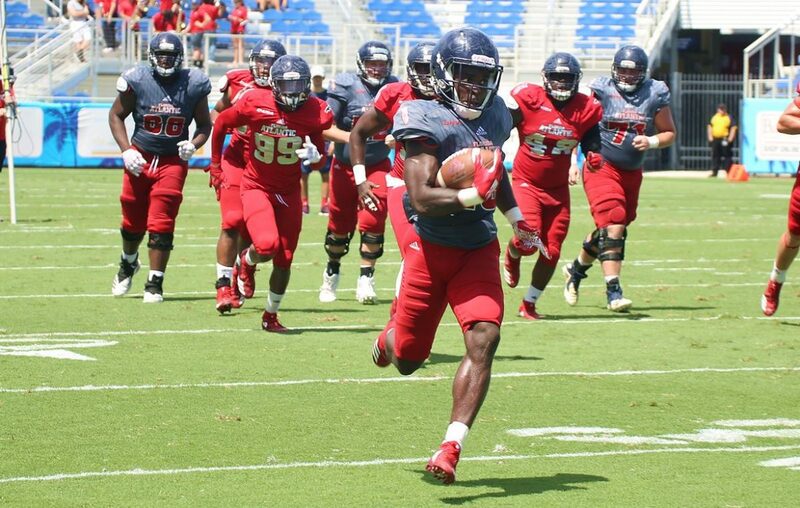 FAU running backs haven’t spent much time in the end zone this spring. 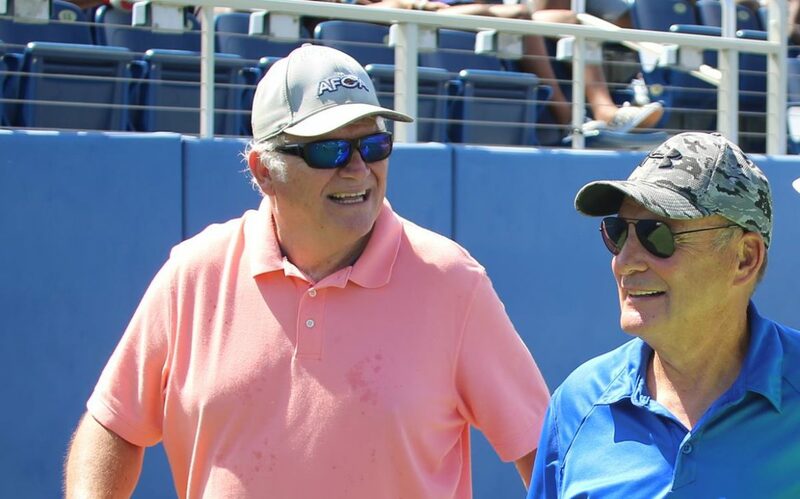 None of them found the promised land in either of the last two scrimmages, those Emmons did score the first spring touchdown with one a run. 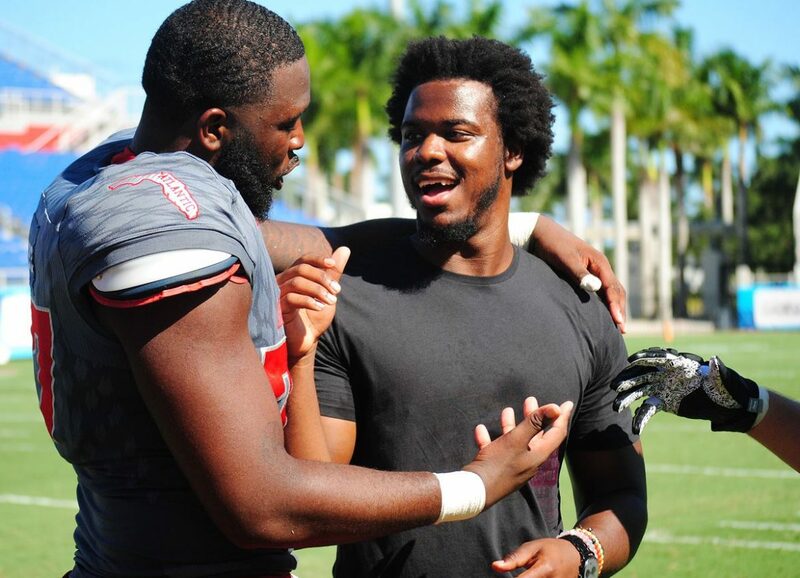 Coaches’ reviews of the running back unit following Saturday’s spring game didn’t exactly bring smiles to players’ faces. 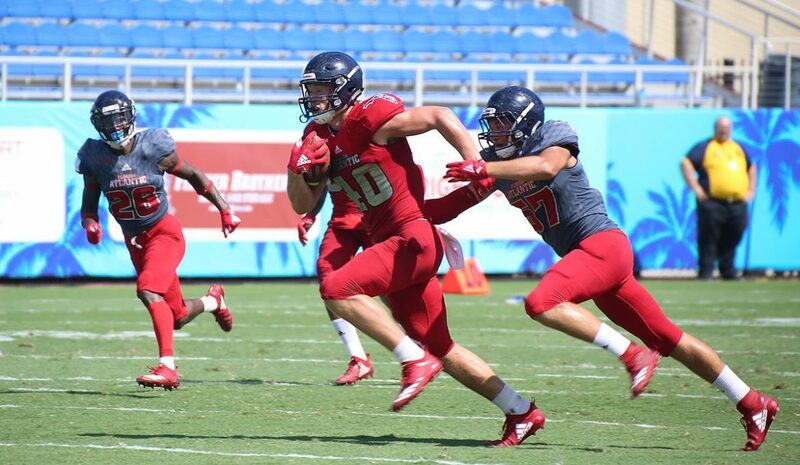 Currently behind redshirt junior James Charles on the depth chart, Emmons expects continued improvement as the offense, and his position within it, become more second nature.